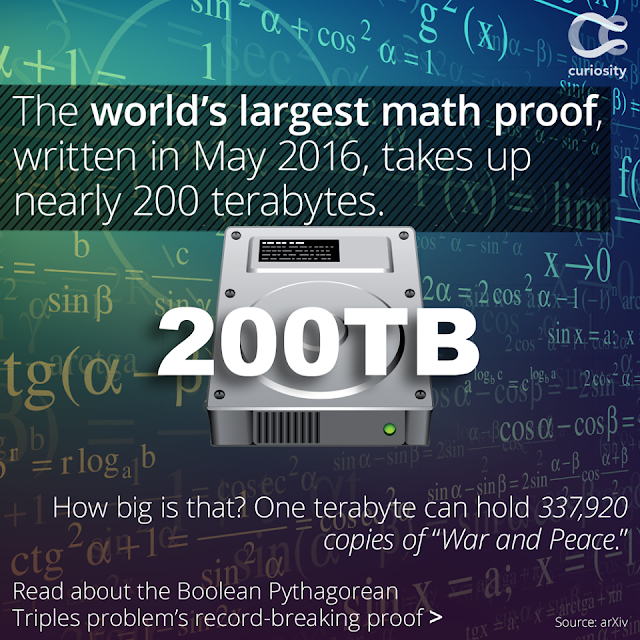 Back in May 2016, the world's lengthiest math proof was assembled. The complete proof requires nearly 200 terabytes, beating out the earlier record-holding proof, which took "only" 13 gigabytes. The Boolean Pythagorean Triples problem was initially postured in the 1980s by a California-based mathematician named Ronald Graham. The Boolean Pythagorean Triples problem, which was cracked and verified by Marijn J. H. Heule, Oliver Kullmann, and Victor W. Marek, revolves around the Pythagorean theorem: a^2 + b^2 = c^2. There are precise sets of positive integers, known as Pythagorean triples, which can be added into the formula, for instance 32 + 42 = 52, and 52 + 122 = 132.